Friday night, May 17, there was a party at the Orchard. We noticed the evidence the next day: a branch was torn off the Early Fuji, there were strewn beer bottles and cans, and a small fire was started (luckily, in the wet grass). Also at the scene, there was also a tightly rolled up $5.00 bill. We’ll consider it a contribution. 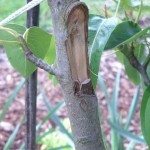 This past Friday, a larger Orcas branch of the 4 x 1 Pear was torn off. That was harder to take. The branch was not torn off completely, still hanging on by its lower edge. All of these events took place behind the thicket of rose and the Orchard sign. Pam and Justin sent the Design Job Description to three top Landscape Architects. 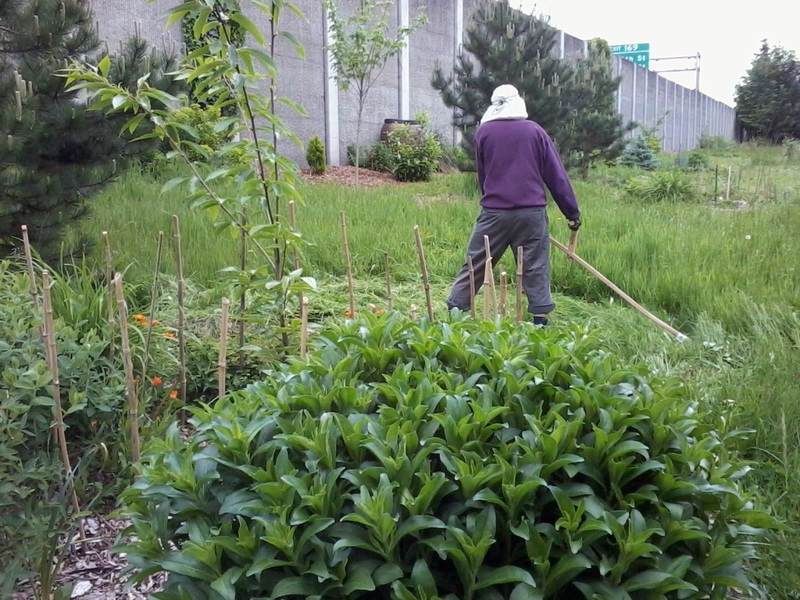 We have a special weeding party this Sunday 2-4pm and our next regular work party is Sunday June 9, 2-4pm. I rushed home to call Ingela. 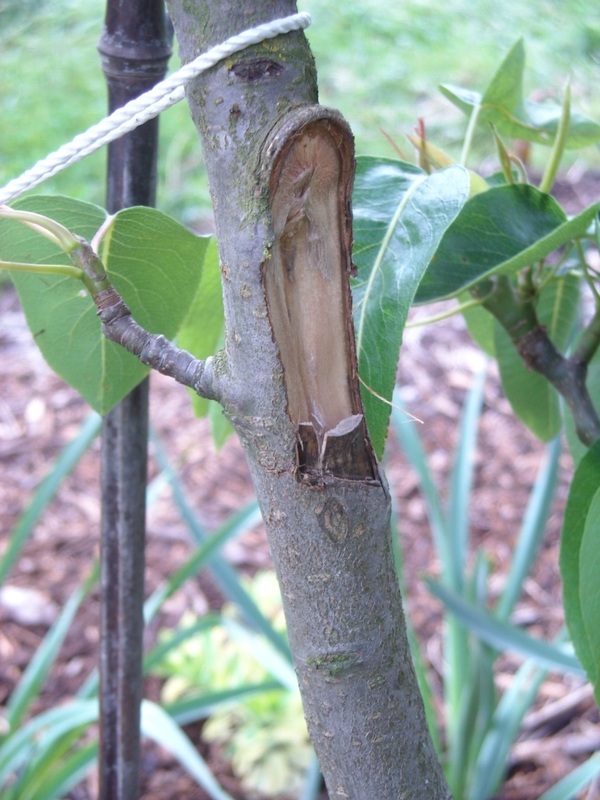 Should I graft the limb back on or cut it off? She said it would be better to cut it off, because the fork was a V-shape, rather than a U-shape. A weak V-shape fork has “included bark”, where bark disappears down into the fork. The bond is weak and will get worse over time. Most U-shaped forks, on the other hand, with all bark visible, are dependable. Had it been our choice to cut that limb off, we would have cut it off just after the crown, but the crown was torn off as well as some of the wood on the trunk. The result is a serious setback for the Pear. Amidst Orchard maintenance and the City Grant activities, we will continue to work on strategies to deal with all external sectors. 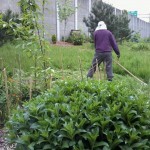 How do we engage with vandals to minimize damage to the Orchard and increase neighborhood safety? Let us know if you have ideas. This entry was posted in Neighborhood Security, Plants and tagged Pear, safety, vandalism on May 28, 2013 by Ruth.